MOSCOW. 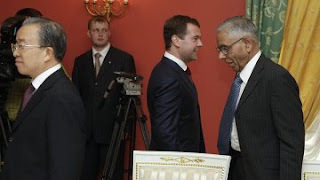 (RIA Novosti political commentator Dmitry Kosyrev) – The leaders of Brazil, Russia, India, and China (BRIC) are due to meet in the Russian city of Yekaterinburg in the Urals in the middle of July. Reelected Prime Minister Manmohan Singh is 76 years old but experts maintain that his age and fatigue from the recent election campaign will not prevent him from attending this meeting, as India maintains a high interest in the BRIC project. The other participants also consider it important. Meetings of the BRIC leaders are no longer sensational. They meet separately during G8 summits, and their foreign ministers invariably spend a couple of hours talking during UN General Assembly sessions each September. There are more and more topics to discuss. The main goal is how to help each other become the world’s leading economies and nations in the near future. The acronym BRIC was first mentioned by Goldman Sachs in a report in 2001. It predicted that the Four would have the world’s largest GDP by 2050. In its report in 2007, the same group wrote that its previous forecast was too cautious, and that they may become the world’s leaders much sooner. Having surpassed Germany last year, China is already the world’s third biggest economy; Russia may become Europe’s largest economy by 2030; India will leave behind Japan in 2035; and China will surpass the United States by 2040. The world economic crisis is only stepping up these trends although it is difficult to predict the time frame. In any event, China obviously has a good chance to emerge the first from the crisis before this year expires, and help some of its partners follow suit. However, nobody predicted that the four countries would like to pool their efforts. In the beginning of this decade, they seemed to have no links with each other, while relations between China and India proved to be complicated. Credit for this goes to Russian diplomacy. Moscow has been and remains the most active organizer of BRIC meetings. For several years, the leaders of only three countries (RIC) were involved in this process until Brazilian President Luiz Inácio Lula da Silva expressed his desire to join them. It was not easy to formulate the agenda for quadripartite talks at the first BRIC meetings. By last year, it became clear that there were too many items on the agenda, and the Four started establishing additional mechanisms for their discussion. The BRIC countries focus on finances, food, food prices, and climate change. That is, BRIC is primarily an economic mechanism. It can also be compared with an early warning system or a search engine helping them to find new spheres of cooperation. BRIC is not yet an organization, strictly speaking, but it is no longer simply a format for quadripartite dialogue. It is taking shape not only owing to the curiosity of the BRIC leaders – what will happen if we sit at the same table? BRIC is promoted by the processes that are taking place by themselves. For instance, despite their problematic relations and the border dispute, India and China raised their trade to the level of $50 billion a year before the economic crisis. Brazil is developing its trade with China, Russia, and India without any BRICs. Therefore, speaking about finances, the BRIC countries agreed at their summit on Hokkaido last year to render mutual financial support in the event of hardship. They are carrying out this decision to some extent. What agreement can they reach in Yekaterinburg? Possibly, they will agree on the ways out of the global crisis. Chinese experts believe that their country will contribute up to 70% of the world economic growth, which will take place despite the crisis. Their Russian colleagues hope that the Four will coordinate their policy on managing the IMF; this issue is also about overcoming the economic crisis and promoting economic growth. Finally, the Four will adopt many decisions reflecting the shared opinion of their leaders – the world economy requires caution and cooperation rather than tough competition for the global leadership.